Water has been ranked as the top global risk in the World Economic Forum’s 2015 Global Risks Report, highlighting the pressing importance of water scarcity in the future of the global community. The water crisis is now according to the report considered as the top threat facing the world in the next ten years. The report is compiled by surveying almost 900 leaders in business, states and charities on the risks facing their sector. 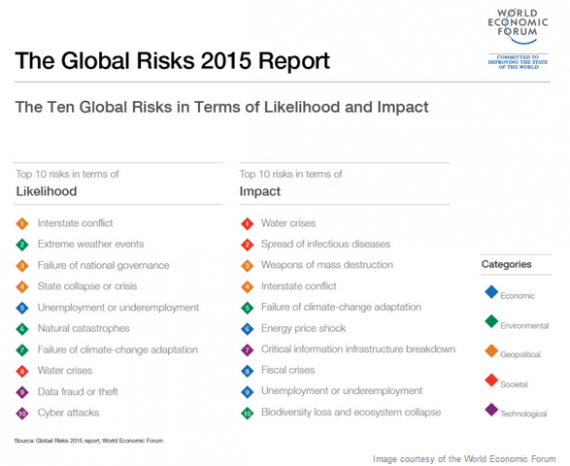 Risks are judged on two factors; the likelihood in the next 10 years and in terms of the degree of impact. Whilst in previous years issues that have often topped the list have been financial and economic, this years report signals the interconnecting links between water and many other risk factors which rely on water. The ascendance of water crises from third to first position in the report in terms of impact, topping nuclear weapons and interstate conflict, shows a growing recognition within the international community about the importance of water. Water is now classified as a societal risk, whereas in the past it has been seen as an environmental risk reflecting the centrality of water to society and that water crises need serious political solutions from industrialised and developing countries alike. In an article from Circle of Blue, Giulio Boccaletti argued that “The types of countries that are more vulnerable to water crises are becoming more important in global politics as the center of gravity moves from the United States and Europe to China and India”. In a 2012 report , the US highlighted water crises in many countries could lead to conflict compromising US national security. Therefore, these recent acknowledgments reflects the increasing importance of countries such as China to global politics. 2014 was a year that water crises became increasingly evident, with Brazil experiencing its worst drought since the 1930s, continuing droughts in California and floods in Kashmir that displaced nearly one million people. Not only do water crises cause suffering and displacement for the people directly impacted they increase the future likelihood for water caused conflicts between states and communities in the future. Water shortages heavily impact global energy and food production and prices sending shock waves across the globe. While as the report suggests not enough is being done to prevent such crises, 2014 did yield some steps of progression such as the historical US- China Climate Change Deal which includes joint research into the water- energy nexus. As the global community has such strong reliance on water- it is paramount that 2015 is a year of serious change for policy makers and business leaders alike.